On Monday 4th August, eight cadets dragged themselves out of bed in the very, very early hours of the morning to board a plane to Oslo. After travelling most of the day we arrived at Haugastol, the hostel which sat at 1000 metres above sea level. We ate like kings and prepared for the days ahead, enjoying our last night on a mattress. 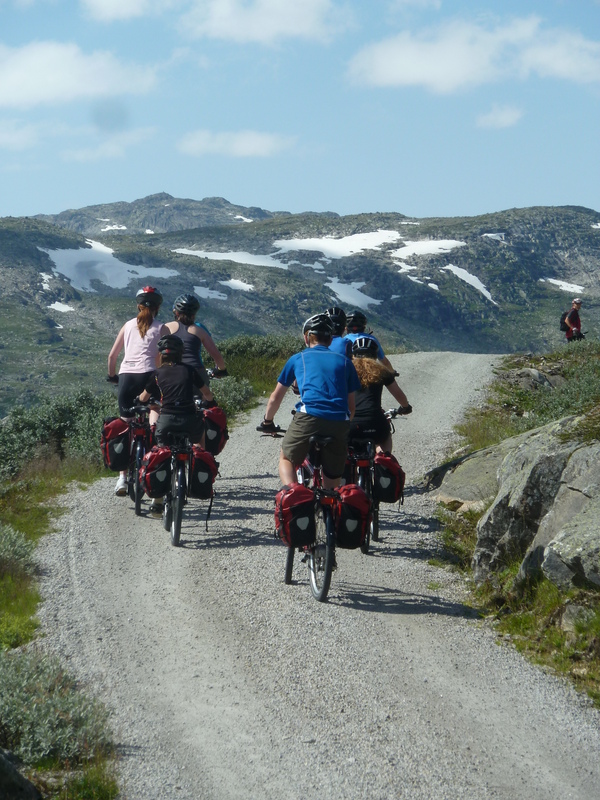 Over the next two days we cycled the Rallarvegen which is a cycling path following the outskirts of the Hardangervidda Plateau, leading you along the Bergen-Oslo railway line from Haugastøl via Finse, Myrdal, Fagernut and down to Flåm. The 80 km ride initially saw us climb to a height of 1300 metres before descending down to the fjords at sea level in Flåm. The descent was keenly felt on the notorious 21 hairpin bends in the Flåm valley, a scary but incredible experience. Finse, where we camped on the first and second nights, was our first glimpse of the Hardangerjøkulen glacier although we got much closer later on in the week. The next four days consisted of walking following a Den Norske Turistforening route over 60 km. These were a tough few days devoid of civilisation and living out of only the rucksacks and tents we carried. The hardships of the cold nights and freeze dried food were made completely worth it by the views of the glacier and the occasional glacial river crossing. We navigated ourselves with some assistance from Major Clayton or Lieutenant Barr and managed to reach a suitable(ish) campsite every night and pitch up. 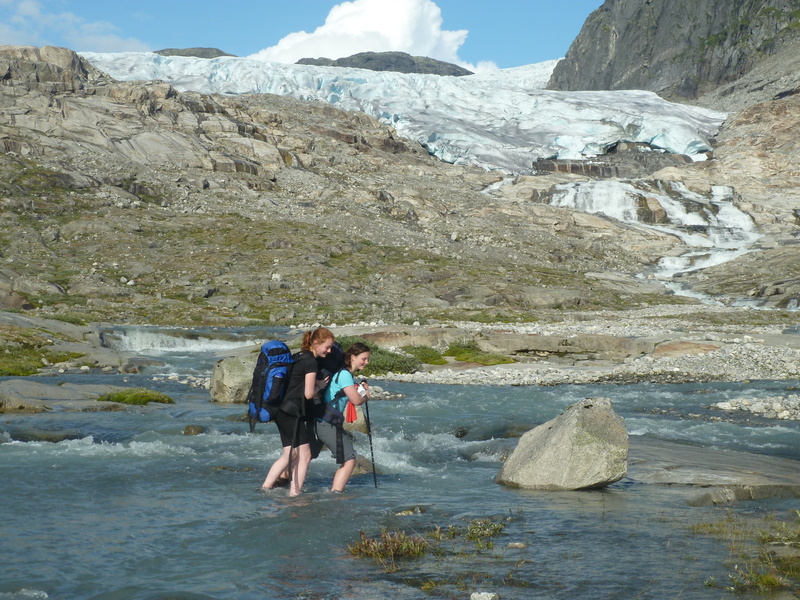 The first day we hiked about 11 km alongside the glacier to camp at the head of a lake. This was our highest and coldest campsite being the nearest to the glacier (the rain didn’t help either!). The following day we hiked another 10 km after waking up to rain and setting off in full waterproofs. The clouds burnt off however and we were walking in t-shirts before long. After an intense day scrambling up and down some very steep mountainsides, we reached the next camp in good time and fell asleep to a pink sunset. Following an eventful morning of catching a flyaway tent and an icy swim to retrieve the errant tent we set off again with Major Clayton putting the map completely in our hands -and we successfully reached the final site. After one last windy evening we got up the next morning eager to hike back to warm showers (or any showers for that matter) and pizza, both of which were received gratefully upon returning to Haugastol. After such an amazing experience we all slept like logs in the hostel, bus, airport and aeroplane but not before visiting the Fram Polar museum in Oslo, and wandering around the exhibition on arctic and antartic exploration and a walk around the ship that took first explorers there. This was the cherry on top of a brilliant trip and all eight of us thoroughly enjoyed every minute (yes even the cold ones). This kind of a challenge taught us a lot about ourselves and our limits which were very tested but with teamwork and motivational talks we got to the end, smiling. None of this would have been possible without the generous financial support given by the Ulysses Trust.